Liverpool are ready to challenge rivals Manchester United for Rosenborg’s Ghanaian midfielder Anthony Annan. CSKA Moscow’s Japanese international Keisuke Honda is attracting interest ahead of the January transfer window with Arsenal, Liverpool, and AC Milan the interested parties. Arsenal, Tottenham and Newcastle are battling for FC Lorient striker Kevin Gameiro. AS Monaco, Hamburg, Schalke 04 and Benfica are also interested in the 23-year-old. 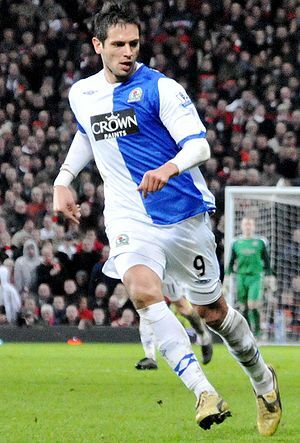 Blackburn are weighing up a £4m January move to bring Manchester City striker Roque Santa Cruz (left) back to Ewood Park. Stephen Ireland is looking for a January move away from Aston Villa. Fulham boss Mark Hughes is keen after the pair worked together at Manchester City, but the Cottagers would struggle to find the £8m asking price. Liverpool and Tottenham target Ola Toivonen expects to stay at PSV Eindhoven this winter – but the Sweden striker has opened the door to a summer move. Lille admit they face a battle to keep hold of Liverpool target Eden Hazard. The 19-year-old winger is also been tracked by Arsenal and Manchester United. Liverpool scouts have also been keeping tabs on CSKA Moscow’s £10million rated Czech Republic striker Thomas Necid. Goalkeeper David De Gea has insisted he will be staying at Atletico Madrid, despite interest from Manchester United. Manchester City and Chelsea are keen on Paris Saint-Germain’s teenage striker Jean-Christophe Bahebeck. The 17-year-old has yet to sign professional forms with the French club. Chelsea are tracking Partizan Belgrade’s teenage centre-back Stefan Savic as a candidate to bolster their threadbare defence. Championship promotion chasers Swansea City want Chelsea striker Daniel Sturridge on loan. Manchester City have made an enquiry about Udinese’s £15m-rated defender Cristian Zapata. Blackburn boss Sam Allardyce has been promised funds to bolster his squad in January by the club’s new Indian owners. Middlesbrough defender David Wheater will move to the Premier League in January, says his former team-mate, Aston Villa winger Stewart Downing. Sheffield United boss Gary Speed is chasing Arsenal’s highly-rated young striker Jay Emmanuel-Thomas for a loan deal. Birmingham City’s £3m midfielder Michel is wanted by Real Mallorca in January on a six-month loan deal. Bolton are ready to let Andy O’Brien join Leeds permanently when the transfer window opens. The defender has extended his loan spell at Elland Road until the start of January. Crystal Palace manager George Burley is set to make a shock move to take Notts County’s much-travelled striker Lee Hughes on loan. Millwall manager Kenny Jackett is ready to bid for Bournemouth’s 12-goal Northern Ireland striker Josh McQuoid. Greek striker Georgios Samaras is poised to be sold by Celtic in January after talks over a new contract stalled, with two Spanish clubs, including Hercules, declaring an interest. West Ham striker Carlton Cole has questioned the tactics of under-fire Hammers manager Avram Grant during their 3-0 loss at Liverpool last weekend. “In the first 10 minutes we had lost the game, psychologically anyway,” said Cole. Chelsea striker Salomon Kalou insists the west London club have not been affected by last week’s shock departure of assistant manager Ray Wilkins. Chelsea striker Daniel Sturridge insists there is no crisis at the club despite recent speculation over the future of manager Carlo Ancelotti. Liverpool’s Ryan Babel has blamed former Reds boss Rafa Benitez for the problems with form and fitness that have blighted his time at Anfield. “I wasn’t allowed to train extra under our former manager. Even when I wasn’t involved,” said Babel on his Twitter feed. German former Tottenham midfielder Steffen Freund says English football needs to take its lead from Germany if the England team is to be successful. The German national U17 coach believes English clubs need to place greater focus on youth development. Former Arsenal midfielder Stewart Robson believes the Gunners are suffering from mental problems and they must overcome them quickly if they are to challenge for the Premier League title. The club have lost four of their last six games in all competitions. Wales still want veteran Manchester United winger Ryan Giggs, who is on a six-man shortlist, as their next national manager. Former assistant manager Ray Wilkins was sacked by Chelsea only two weeks after a bust-up with the club’s chief executive Ron Gourlay, who had criticised the management team’s use of substitutes. Scotland’s referees will today tell the Scottish Football Association that they will not call off their planned weekend strike, but Dutch referees are poised to ensure that the six Scottish Premier League fixtures and the ALBA Challenge Cup final will go ahead. Only one match – Sunday’s ALBA Challenge Cup final – is guaranteed to go ahead this weekend unless the Scottish Football Association can hammer out a peace deal with referees over their strike threat. Scottish Football League chief executive David Longmuir is demanding to know by lunchtime on Thursday if Division One, Two and Three games, plus the ALBA Challenge Cup final, will go ahead despite the threat of a referees’ strike. The Scottish Football Association has provided an assurance to Scottish Premier League clubs that their matches will go ahead this weekend even if there is a strike by referees. A large number of Scotland’s category three referees are unhappy at the stance of their senior colleagues and are dismayed that there was no strike ballot among all members of the Senior Scottish Football Referees Association. The use of foreign officials would have to be approved the Scottish Football Association’s referee committee, which is understood to be sympathetic to Scottish referees’ strike action. Manchester United striker Javier Hernandez has seen his football exploits recognised by a salsa tune. The World Red Army featuring salsa artist Choco Orta have released Chico Is The Man, which details the 22-year-old’s rise to stardom.